As long as I’ve been doing this traveling thing, I’ve been focused on balancing travel with other obligations. In college, I studied abroad during the summers so I could be in town during fall and spring semesters to take my core courses that weren’t offered elsewhere. Since I entered the work world in 2013, I’ve been focused on finding the most efficient way to travel internationally using my limited vacation days. I’ve done quite a bit of firsthand research to figure out how to maximize my time abroad while minimizing my vacation days used. Ultimately, I’ve managed to visit 11 countries while holding down a full time job in finance since graduating from college 4 years ago. So how exactly do I pull this off? My secret weapon, of course! And I couldn’t be more excited to share it with you. What is the 10 day trip? Enter the 10 day trip. What if I told you that you only needed to take 6 days of vacation from work for a 10 day trip abroad? Or, if you are strategic, you may only need to take 5 days of vacation? Would you believe me? From conversations with friends across the US, I know that time away from work is one of the major hurdles that prevents people from planning international trips. They feel perfectly comfortable taking 5 days away from work to visit the beach or family or Disney World, because 5 days isn’t excessive. But traveling abroad? No, that would take way too many vacation days. Except... it takes virtually the exact same number of days to go to Europe that it takes to go to Florida for a week. But, that makes no sense! Or… does it? The logistics of the 10 day trip: how does this work? Planning a 10 day trip abroad with a full time job is all about using freebies (aka: weekends and holidays). You’ll be taking a 5 day week off work, Monday through Friday, just as you would to head to the beach for spring break. Now, go ahead and expand that week to include the weekends on either side of the trip - Saturday through Sunday of the following week - and voila, you have a 9 day trip on your hands right there. 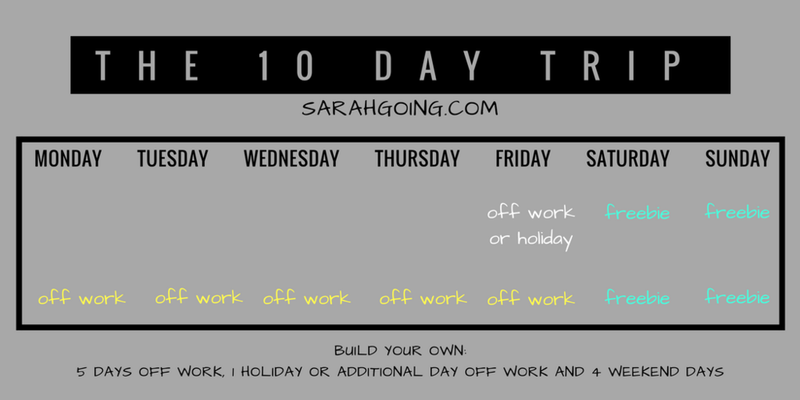 That 10th day can be added in one of several ways, but the best way I’ve found is to find a Friday holiday (such as Good Friday) or to take the Friday prior to your trip off work for a total of 5 or 6 vacation days used for a 10 day trip. Another option: find a Monday holiday (such as Memorial Day) to use as part of your 5 day Monday through Friday week off, then add the Friday prior as a vacation day for a total of 5 vacation days used for a 10 day trip. The next step is to plan your flights so that you’ll have the most possible time at your destination. Option 1: Sleep in (you’re off work!) then finish up the last of your packing on Friday morning. Catch a flight to your connection city if applicable (I live in Nashville, so I tend to have to fly to New York or Atlanta before flying overseas) then fly overnight internationally on Friday night. Arrive at your destination sometime Saturday and spend Saturday night at your destination. Option 2: Work on Thursday, head straight to the airport from work and fly to your connection city (if applicable) then overnight internationally on Thursday night. Arrive at your destination sometime Friday, spend both Friday and Saturday nights at your destination. Destination Notes: this option may not work for long-haul flights to Asia from the US, as those flights tend to leave in the earlier afternoon (so if you have to get to a connection city then head out, you may not be able to pull this off and still get in a full day’s work on Thursday). That being said, I’ve been known to take a half day off work on Thursday coupled with Friday holiday and five days off work the following week (5.5 days off work for the 10 day trip) - be creative with those Asia trips, because the flight time is a huge hurdle with limited vacation days. For trips to Europe from the US, this setup right here is my bread and butter! We’ve covered how to start the 10 day trip, but what about the return flight? Flying back from Europe or Asia to the US is pretty magical. It may not feel magical after 7+ hours on a plane, but it is magical as far as vacation days from work are concerned. While you do lose significant time on that initial trip abroad, you gain it back on the return trip home. If you depart an international airport in Europe or Asia in the morning on Sunday, you’ll find yourself landing in the US… in the morning or afternoon on that same Sunday. Mind bending? Definitely. But also awesome. Grab a connecting flight home if applicable, if you are like me go straight to eat Mexican food, then get to sleep because you’ll be hitting the ground running Monday morning back at the office! But why do I have to fly out on Thursday or Friday? The week I want to travel abroad, flights on Tuesday are cheaper! Keep in mind that the main idea of the 10 day trip is to maximize your time abroad while minimizing the vacation days you have to use. You could apply the principles discussed above and fly out on a Tuesday night after work. Take the following Wednesday and Thursday off work, have Friday as a holiday, accept your weekend freebies, then take Monday through Wednesday of the following week off work for total of 5 days off work and one holiday (or 6 days off work if you don’t have a holiday in the mix)… but oh wait, that’s only an 8 day trip and you used 5 or 6 vacation days for it! Unfortunately, flying Tuesday just isn’t as efficient as flying on Thursday night or Friday. Planning your trip in such a way that it includes two weekends (4 total freebie days) instead of only one weekend is the key to maximizing the time you get to spend abroad while minimizing the vacation days you have to use. I’m a visual/experiential learner, so if you read through the section above and thought, “Um… what?” then hey, no worries. This section is for you. Example 1: On my most recent trip abroad to Austria, Germany and Hungary, I flew out of Nashville after work on Thursday, April 13th at 6:50pm. That following Friday was Good Friday, but my current employer doesn’t offer that day off as a holiday (so you might be able to take this exact 10 day trip using only 5 vacation days, but in this case I used 6). I arrived in Munich at 5:10pm on Friday, April 14th. I then flew out of Munich on Sunday, April 23rd at 11:30am and arrived in Nashville at 7:20pm on Sunday, April 23rd. Example 2: Last fall I took my first solo trip abroad to London and Paris. On this particular trip, I didn’t fly out on Thursday night but instead took a half day off work on Friday. I departed from Nashville at 2:25pm on Friday, October 7th and arrived in London at 7:40am on Saturday, October 8th. I then flew out of Paris at 9:40 am on Sunday, October 16th and arrived back in Nashville at 3:00pm on Sunday, October 16th. This 10 day trip took a total of 5.5 vacation days from work. Is a 10 day trip abroad enough? Over the past 4 years, I’ve gone on quite a few 10 day trips. And this may seem counterintuitive, but I think that the 10 day trip timeline is enough time to make the cost of an international flight worthwhile… if you don’t try to do too much. One of the hardest things about balancing work and travel is that you will be taking inherently shorter trips than you were in college and could study abroad or just backpack around Europe all summer. I’ve noticed that this drives a lot of people to try to see WAY too many cities and/or countries in a short amount of time… and to ultimately feel like they need to revisit every single place they went. The 10 day trip timeline is ultimately about efficiency and balance, and trying to move to a new city every single day you are abroad then returning to the US sick and exhausted just isn’t efficient or balanced. In my experience, three cities in a 10 day trip is the ideal number of destinations… but if you only go to 2 cities, you’ve got even more time for off the beaten path finds and spontaneous exploration. Ultimately, it’s all about finding what works best for you. 10 day trips are made even more efficient by booking multi city flights. What in the world is a multi-city flight, you ask? Learn more here.